2 earthquakes occurred near (under) the volcano during 12 minutes, the last being recorded quake 8 hours ago. Hypocenter depths ranged between 2.5 and 0.1 km. Possible earthquake swarm: 23 earthquakes occurred near (under) the volcano during 20 hours, the last being recorded quake 3 hours ago. Hypocenter depths ranged between 3.7 and 0.9 km. Possible earthquake swarm: 31 earthquakes occurred near (under) the volcano during 22 hours, the last being recorded quake 36 minutes ago. Hypocenter depths ranged between 4.6 and 0.3 km. 3 earthquakes occurred near (under) the volcano during 4 hours, the last being recorded quake 10 hours ago. Hypocenter depths ranged between 7.2 and 0.0 km. 4 earthquakes occurred near (under) the volcano during 12 hours, the last being recorded quake 3 hours ago. Hypocenter depths ranged between 1.7 and 0.0 km. 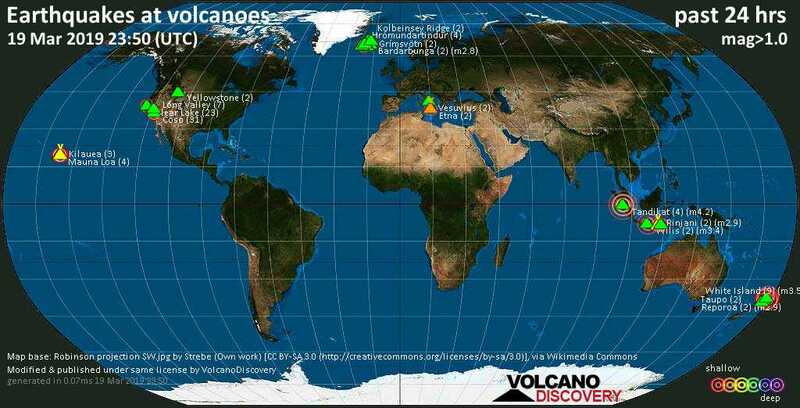 2 earthquakes occurred near (under) the volcano at nearly the same time (05:56 UTC). Hypocenter depths ranged between 5.1 and 4.2 km. 2 earthquakes occurred near (under) the volcano during 9 hours, the last being recorded quake 9 hours ago. Hypocenter depths ranged between 10.0 and 10.0 km. A magnitude 2.7 earthquake occurred at the volcano 9 hours ago. The quake, which might be volcanic in origin, was located at a depth of 12.0 km depth at 19 km distance NW from the volcano. 4 earthquakes occurred near (under) the volcano during 6 hours, the last being recorded quake 5 hours ago. Hypocenter depths ranged between 14.0 and 10.0 km. 9 earthquakes occurred near (under) the volcano during 13 hours, the last being recorded quake 5 hours ago. Hypocenter depths ranged between 8.0 and 3.0 km. 2 earthquakes occurred near (under) the volcano during 29 minutes, the last being recorded quake 13 hours ago. Hypocenter depths ranged between 10.0 and 10.0 km.